2d barcodes were everywhere on our recent trip to Japan, and seem to be gaining more attention here in the UK in some unexpected places. I recently downloaded Kaywa’s QR Code reader to my Z610i. I find it really exciting that communications media have changed so much in my lifetime. At school I played with lead type and got inky fingers. Now I play with mobile phones and have one thumb bigger than the other. 2d barcodes bridge that divide, being printed in ink on paper yet offering an instant connection to the digital world. 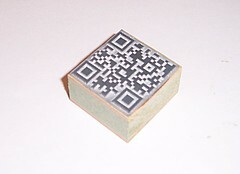 What better way to reflect on the interface between old and new media than to get my QR code made up as a printing block. It had to be big enough across for a phone to read accurately – I went for 1.5 inches – and exactly type-high – that’s the 0.918 inch standard for lead type. KPE Graphics of Kettering obliged – I mailed* them my artwork as a 1200dpi JPEG on Monday and the finished block arrived by post in a Jiffy bag today. The photo above shows the block in its pristine state, but it won’t stay that way for long. Next step is to dig out my old printing kit from the loft and make a few proofs on paper. * Postscript: I realised I meant e-mailed, of course. I love this old/new tech mashup. I use an inkpad for notarizing documents, now I want to get a rubber stamp QR code to use with my inkpad.